Father’s Day is a time to set aside everything else and devote the day to your dear old dad. If you are not a golfer but your dad is, take some time to share his favorite pastime. Go on a hike, a brewery tour, concert, camping trip or lunch at his favorite restaurant. Celebrate everything your dad has taught you, and also create something new and memorable with him on this very special day. What are your plans for Father’s Day this year? Are you still looking for things to do in the DFW area? 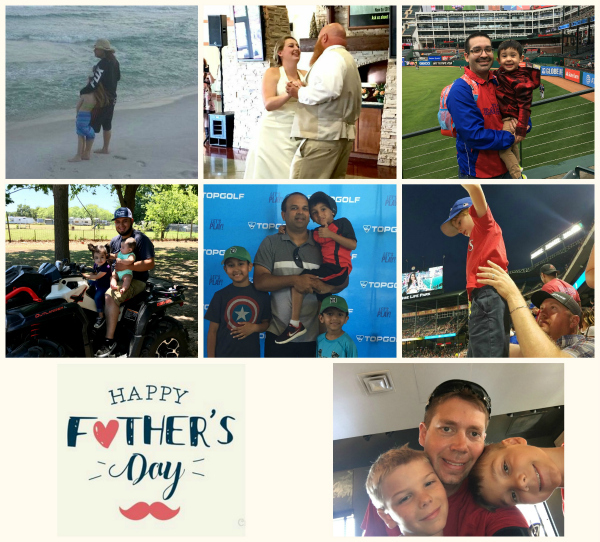 We have a few suggestions that will provide plenty of Father’s Day fun and excitement, no matter what your dad loves to do. Here is a collage of our husbands and kids, just for fun! Once upon a time, dad's were known for liking things like smokeless tobacco and John Wayne movies -- that's certainly still true for some -- but, younger dudes reaching peak dad-dom often relate more to vintage arcade cabinets and pin-ball machines. Running August 5-6, 2017 at the Irving convention center, the Let's Play Gaming Expo features 85-plus vendors, 90-plus arcade cabinets and retro gaming tournaments with games like Smash Bros and Tetris. One-day admission is $15 in advance or $20 at the door and children 12 and under are free with an adult ticket. On a tight budget? Richardson's Free Play Arcade offers a wide variety of classic titles like Donkey Kong, Burger Time, Pac-Man and Joust for quarter-free play. Ten bucks at the door gets you all the games you want and adults can stay late for beer and bar food. Another great, LOCAL place to us here in Keller, is Tornado Terrys! Baseball and Dads go WAY back! Watch one of the below listed teams hit a few dingers! Does your dad like to shoot? How about a day at the shooting range? Or if not guns, then how about Archery? If you are looking for adrenaline-fueled fun, try paintball! And what dad is ever too old for a little competition… Race dad at the Go Kart tracks!! Last but not least, TOP GOLF is always a great time!